RAY BROOK, N.Y. – The Adirondack Park Agency is considering a plan to eliminate the requirement for a formal environmental review before the state grants permission to undertake major clear-cutting in the private forests of the Adirondack Park. The damage done to the forests and waters of the Adirondack Park by widespread clear-cutting was the reason why the public voted to protect the park’s public forests via the NYS Constitution, declaring them to be “forever wild” in 1894. Private forests have been under the jurisdiction of the Adirondack Park Agency since 1971. The Adirondack Park Agency Board of Commissioners is expected to vote on the fasttrack permit proposal at its January 10 meeting. The organizations urged the public to contact the agency and ask it to reject the plan. Currently, timber companies and other landowners must get a permit from the Adirondack Park Agency for any clear-cut above 25 acres on non-wetlands. Clear-cutting is the practice of removing all of the trees from a parcel of land. An acre is about the size of a football field without the end zones. In order to get that permit, current applicants must undergo a formal environmental review that includes public notice and public participation and approval by the Adirondack Park Agency’s Board of Commissioners. The new plan would eliminate those requirements by allowing agency staff to issue permits, without a vote by the board of commissioners. This new fast-track approval process would apply even to lands where the state has purchased a conservation easement to ensure that the lands are managed responsibly and sustainably. Under the plan, park agency staff members could accept as adequate almost any forest management plan, including those overseen by the timber industry (Sustainable Forestry Initiative) rather than independent third parties (Forest Stewardship Council). The Adirondack Council is a privately funded, not-for-profit organization dedicated to ensuring the wild character and ecological integrity of New York’s 9,300-square-mile Adirondack Park. Founded in 1975, the Council carries out its mission through research, education, advocacy and legal action. Council members live in all 50 United States. The Sierra Club’s mission is to explore, enjoy, and protect the wild places of the earth; to practice and promote the responsible use of the earth’s ecosystems and resources; to educate and enlist humanity to protect and restore the quality of the natural and human environment; and to use all lawful means to carry out these objectives. ALBANY, NY – The release of the Proposed Final Draft of the Hoffman Notch Wilderness Unit Management Plan (UMP) was announced by the New York State Department of Environmental Conservation (DEC) and the Adirondack Park Agency (APA) today. DEC staff will present the Proposed Final UMP to the APA Board at their monthly meeting on February 16. 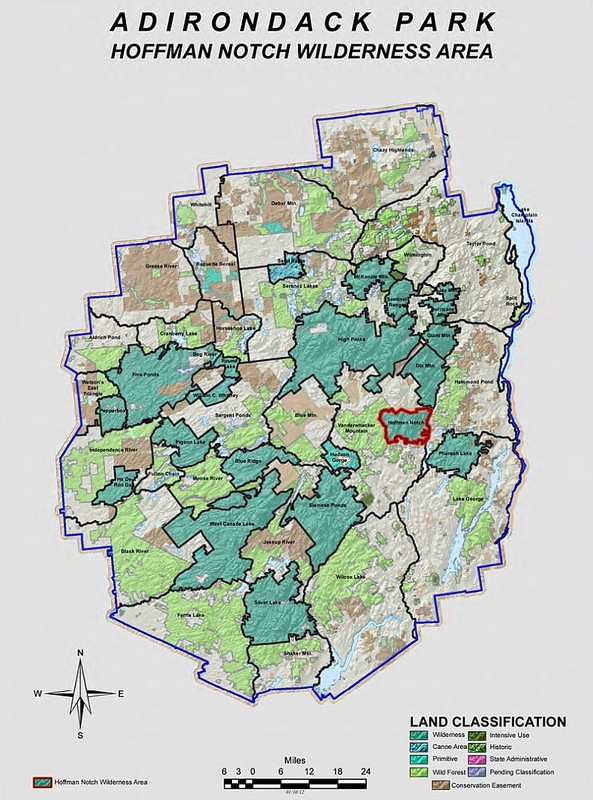 A first reading of the UMP will be presented to the State Land Committee at 1 pm for them to consider the UMP’s compliance with the Adirondack Park State Land Master Plan (SLMP). A determination of compliance with the SLMP will be made by the APA Board at their monthly meeting in March. APA will accept public comments on SLMP compliance for the proposals contained in the draft UMP. Public comments will be accepted until 12:00 PM on Wednesday, March 7. The final step in the process is approval of the UMP by DEC. The Hoffman Notch Wilderness consists of 38,500 acres of forest preserve lands in the Towns of North Hudson, Minerva and Schroon Lake in southern Essex County. It is situated near the communities of Newcomb, North Hudson, Schroon Lake, Minerva and Olmstedville. The unit is generally bounded on the north by the Boreas Road, on the east by the Adirondack Northway, on the south by Hoffman Road, and on the west by the boundary of Vanderwhacker Mountain Wild Forest. The Hoffman Notch Wilderness offers many recreational opportunities, including but not limited to hiking, cross country skiing, camping, canoeing, hunting, trapping and fishing. With more than 18 miles of marked trails available, the public can easily reach a variety of natural attractions such as Hoffman Notch and Mt. Severance, as well as popular fishing locations at Bailey Pond or Big Pond. Other scattered water bodies providing additional recreational uses include Big Marsh, North Pond, Sand Pond and Marion Pond. The UMP proposes to develop an approximately 12.5-mile segment of the North Country National Scenic Trail (NCNST), including 6.6 miles of newly constructed trail, through the southern portion of the Hoffman Notch Wilderness. Associated to the NCNST, the plan also proposes to construct a lean-to near Platt Brook and a primitive campsite on Bailey Pond. NCNST is a proposed 4,600 mile non-motorized trail system from Lake Sakakawea, ND to Lake Champlain, NY. One of eight federally designated National Scenic Trails, the Adirondack portion of the NCNST will stretch 140 miles and connect with a number of Adirondack communities. More information on the Adirondack portion of the NCNST can be found at: http://www.dec.ny.gov/outdoor/39658.html. Improving the accessibility of trails to Bailey Pond and a portion of the Big Pond trail. 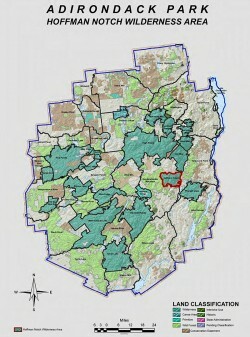 UMPs are required by the Adirondack Park State Land Master Plan for each unit of State land in the Adirondack Park. The plans integrate the goals and objectives of the State Land Master Plan, related legislation, and resource and visitor use information into a single document. Comments must be received by 12:00 PM on Wednesday, March 7. PAUL SMITHS, NY – The Adirondack Park Agency Visitor Interpretive Centers (VICs) at Paul Smiths and Newcomb will combine three popular festivals into one Agencywide festival on the Martin Luther King Jr. Day weekend, creating the Chilly Ski & Snowshoe Festival from 10 a.m. to 3 p.m. on Saturday, Jan. 17 at both facilities.